If you like mystery and adventure combined with a bit of old school fairytales, then this hidden object game is the game for you! In Fiction Fixers – Adventures in Wonderland you start out as a young cadet, who’s just joined the Fiction Fixers, a group dedicated to protecting classic literature. Sadly, last night The Illiterati – an infamous organization dedicated to the destruction of all fiction – broke into the Hall of Fiction and stole many valuable books! Their first target is Alice’s Adventures in Wonderland and an agent has already transported himself into the book and started altering the storyline, which eventually may lead to the book being completely wiped out. As a Fiction Fixer, it’s your duty to protect this work of art and restore what the Illiterati has damaged. The question is: are you ready for your first assignment? Fiction Fixers – Adventures in Wonderland begins as you follow Alice down the rabbit hole. 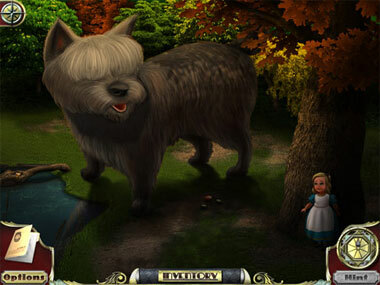 The flow of the game is slightly different than the usually structured hidden object game and instead you get to follow the original storyline while making sure the Illiterati haven’t changed any facts of the story or planted any evil obstacles. Where you do encounter a change in the original storyline you will come across a hidden object scene or a mini-game in order to fix everything back to its origin. While the Illiterati doesn’t manage to do too much damage, you do have to track down plenty of hidden objects and solve many puzzles and while the game isn’t timed you do have to watch out for too many clicks in the hidden object games as this will deactivate your mouse arrow for a few seconds, plus you get a creepy laugh from the Illiterati agent which will send chills down your spine! 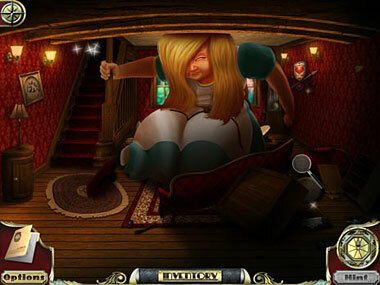 The hidden object scenes really blend well with the plot of Alice in Wonderland; for instance finding sharp objects (planted by the Illiterati) in a pile of leaves so that Alice can land safely from her fall down the rabbit hole. 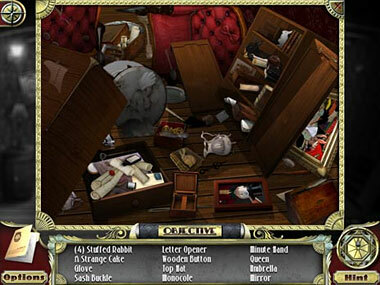 Some of the hidden object scenes also provide necessary items to continue with the story, like a key that opens a chest to the next adventure or an ingredient for a mysterious potion. The Fiction Fixers – Adventures in Wonderland game does have a lot of going back and forth in the plot, which means that you might make a shrinking potion as a mini-game or fix the broken tiled floor, only to walk past these scenes again on your way to another mini-game. Luckily, if you get lost you can always take a peek at the map with important indicators and tips, which informs you about active game areas and where you need to go next. Fiction Fixers – Adventures in Wonderland also has great add-ons like collecting all 52 cards in a deck, which gives you a bonus or a mini-adventure with Hansel & Gretel after mastering the main game. With amazing visuals, dazzling characters and some truly fun gameplay, this is a great opportunity to lose yourself in Alice’s dream world! 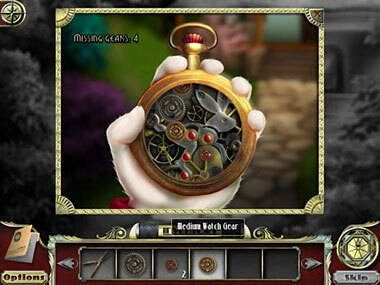 Download and play the full-version of Fiction Fixers – Adventures in Wonderland for FREE! I have downloaded fiction fixers, adventures in wonderland and it will never move past the first scene with the clock, rabbit, and alice. How can I play the game?